TNPSC Exam is considered as the Top Most Government Examination in Tamil Nadu State. Thousands of students appear for the TNPSC Exam every year. These students pin their hopes of cracking these exams on the coaching institutes that they attend. You too can win this race with sincere efforts, continuous hard work and unrelenting perseverance. You need to practice at home after studying at the TNPSC coaching center in Chennai . You can also prepare at home while you work and study. TNPSC GROUP 2 Main Books is conducted to fill vacancies at the top most levels in Tamil Nadu Government Departments and is conducted in three stages. The TNPSC Group 2 exam books opens doors to the posts of Municipal Commissioner, Grade-II, Deputy Commercial Tax Officer, Sub Registrar, Grade-II, etc. The TNPSC VAO (Village Administrative Officer) Exam is another popular exam. These exams are in short listing stages that requires a focused approach and hard work. Only hard work will not allow you to claim success but right coaching guidance will keep you focused in the vast ocean of syllabus. We highly recommend a self-study plan that will keep you on track .To assist with your preparation we recommend that you refer to the TNPSC books, TNPSC VAO books, TNPSC Group 4 books, etc. available at http://surabooks.com/Category/6511/competitive-exam-books/tnpsc-exam-study-materials/ . 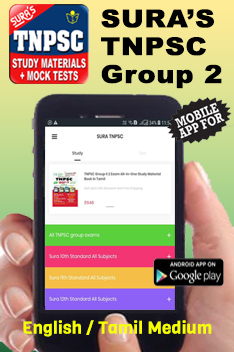 Our study material is sure to help you succeed at the Group 1 and Group 2 exams as it includes inputs from officers in various departments who have dedicated their valuable time to pass on their knowledge and exam tips to students attempting the TNPSC exams. We provide comprehensive, content rich and subject specific study material to students. All these resources are ably backed with the model test papers and well-structured mock tests. Our in-depth educational experience provide you with the best chance of clearing the prestigious TNPSC exams. Only those who learn to blend hard work and smart work will be able to sail through and hit the highway to success. The books and guides available at Surabooks.com will provide you with the required competitive edge to clear the exam comfortably. These are authored by best faculties in the industry and are supplemented with Analytical questions and Model Question Papers which are unique and exam oriented. These books are available both in English and Tamil and has comprehensive material on each section that is covered in these exams. It also includes previous year’s papers so that you can prepare yourself to the best of your ability. These books also contain the set of answers and solutions with detailed explanation, so that you can learn while you practice. We also offer subject-wise books that cover the entire syllabus as prescribes by the TNPSC. So pick out the books that will steer you to be a successful officer by cracking the TNPSC Exam.